I, Mae West, should've known that something was wrong when Paul, my husband, told me about a secret compartment in his sock drawer. He said, "Mae, if anything happens to me, go to the sock drawer." When the FBI raided our upper Manhattan apartment in the middle of the night and seized everything we own, including our house in the Hamptons, clothes, and cars along with our fortune. Little did I know that my husband had been using his brokerage firm in a Ponzie scheme and had stolen millions from family and friends. Long story short, and a long RV drive to Normal, Kentucky...the much needed vacation at the Happy Trails Camp Ground, the only thing I owned that wasn't seized, where the brochure showed lush Kentucky Bluegrass and a lake with a beach to lay around on, turned out to be a run down, dried up, and mucky green lake that I wouldn't put a pet fish in. If things couldn't get worse, the citizens in Normal weren't exempt from Paul's bad business dealings and I was the last person they wanted to see. But, with the little charm I had and the big ideas to bring the camp ground back to life and make Normal a tourist town, again, I gained a few friends. . .until. . .Paul broke out of prison and showed up dead in the lake. One problem, I didn't kill him. Someone beat me to it. I'm having a hard time convincing the charming and southern detective on the case, but I do have a few leads up my sleeve, not to mention learn how to manage a dilapidated camp ground. Until now, my idea of camping included room service. I'm learning a lot about voltage and amps along with camp food. Have you ever gone camping at a camp ground? What's a good tip for me? Leave a comment and Tonya will donate a book to a library of your choice! Tonya will pick a winner in the morning! Preorder today! 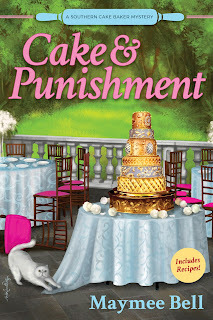 Releases May 25th! Welcome to Normal, Kentucky~ where nothing is normal. A Camper and Criminals Mystery Series is another brainchild of USA Today Bestselling Author Tonya Kappes. 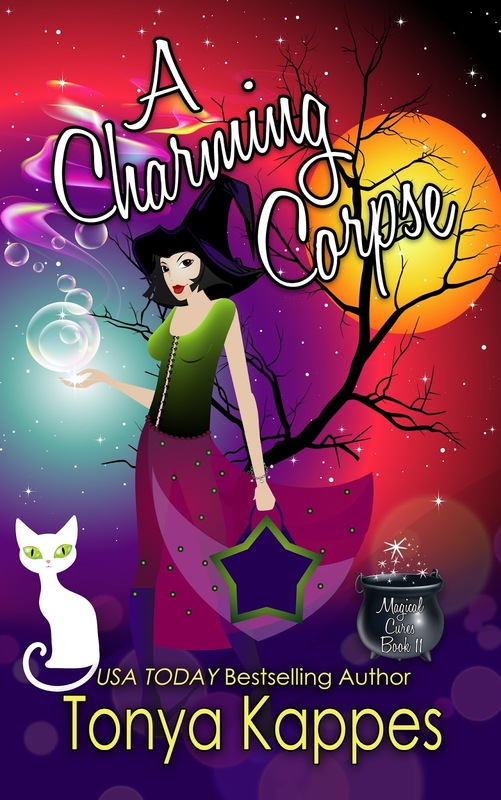 If you love her quirky southern characters and small town charm with a mystery to solve, you're going to love her new cozy mystery series! Mae finds herself homeless, friendless, and penniless. All hope isn't lost. . .the only thing Mae got to keep that the government didn't seize is a tourist camp ground, Happy Trails, in Normal, Kentucky and an RV to live in. One problem, Mae's idea of camping has room service. Do you love chatting over coffee or tea? So does Tonya!! Every Tuesday you can join Tonya on her blog Tuesday Coffee with Tonya! She gives away an Amazon gift card every week, along with book sales of her friends and of her own. There's a lot of chit-chat and fun, so come on over and join today! Click here and subscribe! 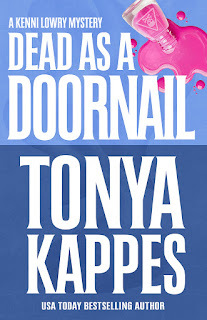 Tonya Kappes has three more books on preorder that you don't want to miss out on. 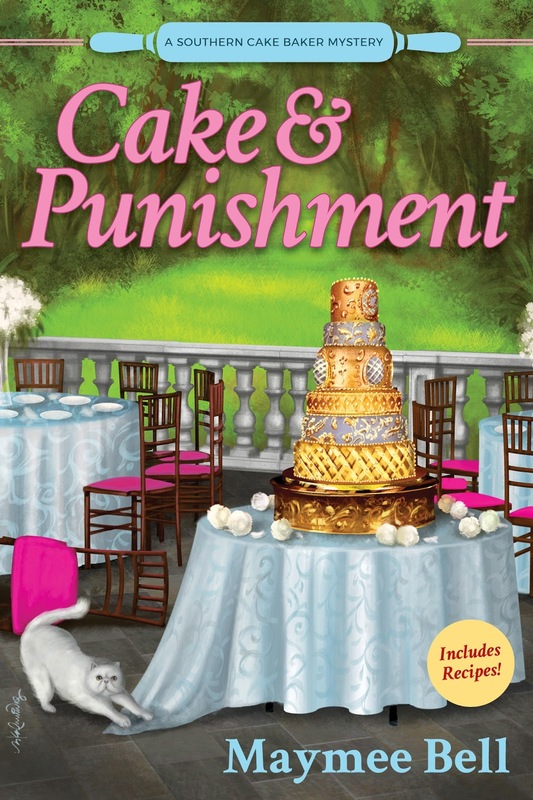 CAKE AND PUNISHMENT is the first book in the new A SOUTHERN CAKE BAKER MYSTERY SERIES under Tonya's pen name MAYMEE BELL (Tonya's granny was Mamie so she put a fun twist on this old southern name). Click here to grab the preorder for the May release. A CHARMING CORPSE is the 11th book in Tonya's USA TODAY Bestselling MAGICAL CURES MYSTERY SERIES. Click here to grab the preorder before the April 20th release. DEAD AS A DOORNAIL is the fifth book in the KENNI LOWRY MYSTERY SERIES. This series is loosely based around Tonya's small home town of Nicholasville, Ky! Click here to grab the preorder before the May release. I would nominate the Yankton Community Library, in Yankton,SD to receive a book. I would agree with Mae West, so often we see brochures that picture a beautiful beach that is clean and neat and you can't wait to get there. Upon arrival, you find it is nothing like the brochure. When my son was little we would go camping a lot. Our favorite place was Gettysburg in the Fall. Once on the way home, I think we stayed at Happy Trails "long lost PA cousin". Shuttering just thinking about the place. My tip would be, always make sure you have the right size batteries for flash lights and lanterns. Oh, and meat cooked over a wood fire tastes great. The South Branch of the Muskingum County Library would love a book! Thanks! Went camping a couple of times and had bad experiences. I no longer want to go.one time had porcupine come in tent. Make sure to close all zippers. Another time my daughter was a baby and it rained that afternoon, she was not happy camper. I would like to nominate Blue Ridge Regional library in Martinsville Virgina because they a large library system that has suffered many budget cutbacks. But work hard to try and make sure we have the books we love. The Niles Public Library in Niles, IL in appreciation for helping me fill in the gaps in my personal library of your Ghostly Southern Mystery series. 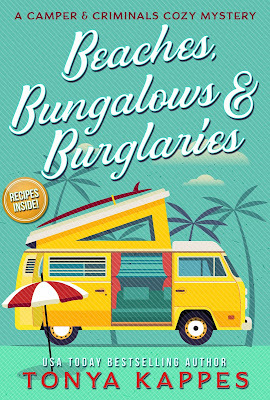 I'd request you send it Beaches, Bungalows, and Burglaries so I can check it out. My library is great. So many activities for every age group, a book sale every month. I think they deserve to receive a book. Thank you for doing this for which ever library you choose. Oh, I am so excited for this series!! Eeek. :D I'll nominate the library I work at: Bellaire Public Library in Bellaire, OH. Campfire Apple Pies - Spread a layer of apple pie filling between two oatmeal cookies. Wrap in foil and place on the grill until heated through. Unbelievably good! Marion county public library system. I'd put Sumner Public Library down for winning your book!